This blog entry was written by Allie Brown, former Clean Energy Advocacy Manager at SACE. 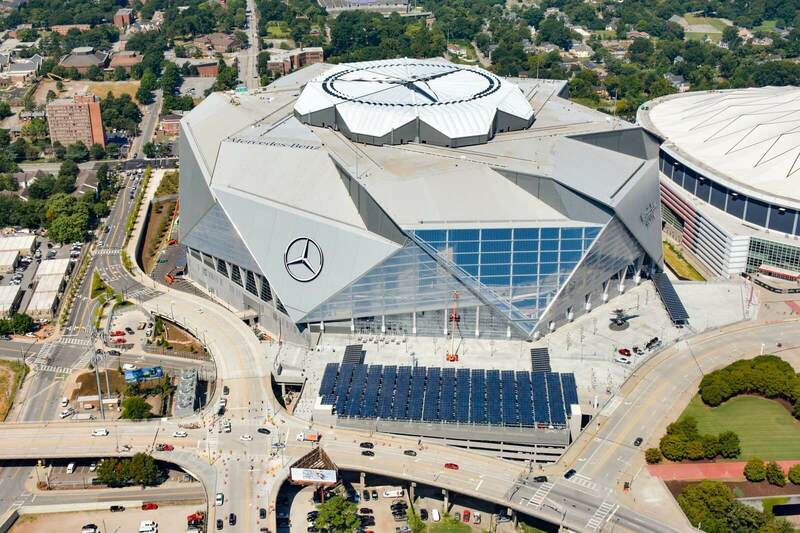 How does Atlanta, a city that recently committed to 100% clean energy by 2035, and it’s brand new stadium, Mercedes-Benz, compete on the largest stage of the year when it comes to sustainability? Short answer: Pretty darn good. This upcoming Sunday marks one of the most anticipated sports games of the year as the New England Patriots take on the Los Angelos Rams in Super Bowl LIII. All eyes will turn to Atlanta as football fans from across the country make their way here (and Atlanta natives like me prepare to avoid the insane amounts of traffic that will follow). It’s not surprising that the National Football League (NFL), a massive American industry, also contains a massive carbon footprint. In fact, the Dallas Cowboys’ stadium consumes about 750 megawatts of electricity during peak times – which is apparently enough to power a midsize US city. So, how does Atlanta, a city that recently committed to 100% clean energy by 2035, and our brand new stadium, Mercedes-Benz, compete on the largest stage of the year when it comes to sustainability? Short answer: Pretty darn good. The Mercedes-Benz Stadium, which opened in 2017, is the first sports stadium in the world to achieve a LEED Platinum designation, which is the highest certification from the U.S. Green Buildings Council. Some of the highlights include carports covered in 4,000 PV solar panels, a 2 million gallon stormwater recapture and storage system, and the world’s largest LED lighting scoreboard. 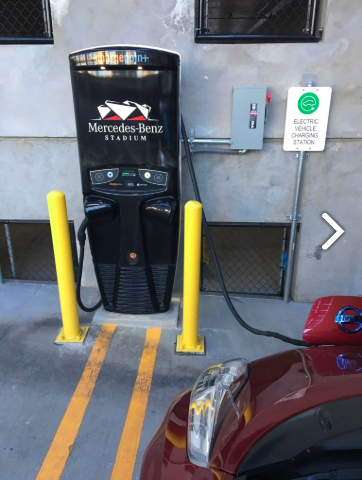 When it comes to traveling to the actual game, the stadium provides a bike valet option outside, and 48 Electric Vehicle (EV) charging stations in nearby parking lots. Off the field, the home teams from both the Atlanta Falcons and Atlanta United F.C. participate in sustainable practices in the Atlanta community, like participating in food recovery and donation activities and partnering with Trees Atlanta. But why did Atlanta go all in on this state of the art LEED Platinum building? Arthur Blank (or Uncle Arthur as we like to call him), is the owner of the Falcons and main funder behind the new stadium. He apparently told the architects that sustainability was an important factor from day 1: “We set out to build a venue that would not only exceed expectations, but also push the limits of what was possible in terms of stadium design, fan experience, and sustainability,” Blank said. Sure, having the honor of building the most sustainable stadium in the world is an amazing accomplishment to flaunt, but I have to believe that it’s more than that – it’s about the money. Blank, a businessman at heart, had to be thinking about the long-term savings. And the numbers from the first few years of operation show just that: The stadium uses 47% less water and 29% less energy than a typical stadium, greatly lowering the costs to put on these massive sporting events. While the Atlanta Falcons fell short this year on making it to the Super Bowl, I can’t help but feel proud of my city for taking home a major win when it comes to creating a sustainable environment for the Super Bowl this year. Regardless of the outcome of Sunday’s game (although let’s get real… I’m a Falcons fan and loathe the Patriots so… GO RAMS), this Atlanta stadium has scored a major touchdown for sustainability and clean energy. Let’s hope the rest of the NFL can become contenders of the Green Super Bowl in the future, but it’s clear that this stadium will be hard to top!